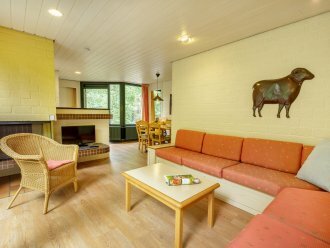 If you are looking for a holiday park for toddlers, Center Parcs is the place to be. You can really enjoy each other's company in our parks. In your fully equipped cottage with your own private garden, in subtropical swimming paradise Aqua Mundo, and during all children's activities. Say yes to what really matters, making new memories together. Also profit from family- and/or early booking discounts. So practical: your cottage has a kitchen, spacious bathroom and a private garden, surrounded by nature. Perfect to enjoy a carefree holiday with your toddler. You don't have to carry things around: the baby bed and high chair are already there. Safety above all: everything is on the same level, or the stairs are secured with a stair gate. Order the free Baby Service Package with changing pad, buggy, a bouncer, baby bath, and a baby box at a fee. Simplify things for yourself, and order the Cottage Services, such as grocery package or the pizza-delivery service! An extra special stay? Book a New generation Kids Cottage with a playroom and fenced off playground! Don’t forget to treat yourself: in a VIP cottage, you can enjoy your own private sauna and fresh pastries every morning. No need to worry about midweeks or weekends, but choose your own arrival day and length of stay. You really get in touch with each other again. Splashing around together in subtropical swimming paradise, playing and crafting, heading outdoors, go out for dinner... Those are memorable memories! Unlimited access to Aqua Mundo: qualified lifeguards, family changing rooms, high chairs, Early-Bird-Swimming (nice and quiet) and a Children’s pool. Go and have dinner together in the tropical Market Dome with special children's menus and playground equipment. Enjoy children's entertainment with Orry & Friends, such as Bed-time Stories, the Orry & Friends Show and the Kids Disco and Kids Parade. Free of charge! Many parks have a BALUBA indoor play paradise for climbing, sliding and playing around. Rabbits, goats and other animals are just waiting to be stroked at the Animal Farm – feeding time is extra fun! Children can play in a tightly stretched net between the trees in the Kids Wobbly Web. During the Kiddies program, children can craft whatever they want. Come and relax in our spa facilities, like sauna and massage treatments.